No this is not about choosing the right exercise, although that could be a choice for you. Really this post is more about breaking free of a habit based existence and exercising this little thing called choice in your life. As human beings we tend to create habits for ourselves some good and some not so good, but nonetheless we live out these habits. For many people breaking a bad habit is something that takes a crisis not because that is the best approach, but it is in our nature to stick with that habit even though it may have very negative consequences. Consider the heroin addict, smoker, or alcoholic it often takes a dire consequence, a pretty severe wake up call for them to even think about moving away from the habit by choice. We have all been there, following some bad habit that may be detrimental to our health, relationships, or careers. I contend that we naturally stick with the habit and we are not exercising a choice but simply sticking with what is familiar. Think about your day or your typical week, how much of it is made up of rituals you have developed. What do you do in the morning, my guess is you follow a pretty regimented routine, preparing yourself for a work day, and then arriving at the office within a 15 minute window of time. Of course these are not necessarily bad things, but they exemplify how we like to follow a pattern of behavior, a ritual if you like. Are there habits you should cling too? Maybe, but don’t be to hasty, even what you perceive as good habits or patterns of behavior may be limiting you. Let’s take the person who gets up every morning and goes running, sounds like a good habit doesn’t it. Would another form of exercise be maybe even more beneficial from time to time? Oh no I run every day, not by choice so much as I am now a runner and have created a daily habit and short of a pretty bad injury that is where I am headed in the morning. See we create paradigms that we actually live out. I am a project manager, I am a runner, I am a brick layer, I am a doctor, I am in law enforcement, I am a tax attorney, I am stock broker, I am something. I have created a category, a role for myself, and thus limited my choices. Regardless of all the silly ways that society reinforces the limitations that go along with your role and tries to box you in to a set of required skills, it does no define your potential. A runner can lift weights or do yoga, a brick layer can be a florist, a tax attorney can be an artist, a college drop out at Harvard can create Microsoft. The point of all of this is you have choices as to how you spend your time, hopefully you see yourself as more than a role you fulfill. 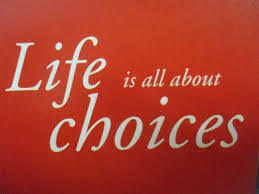 Choice is something we really don’t exercise much, but it is more available than you think. Start with those negative habits that enslave you such as smoking, drinking, drugs, a poor diet, bad relationships, or a dead end job. Start making a conscience choice to follow another path, an alternative action. Otherwise let your habits consume you and dictate your future, you have a choice.